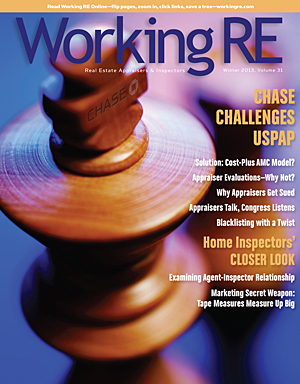 Editor’s Note: Last issue we reported on an important Congressional hearing on the appraisal profession. The following are the Top Ten Appraisal Reform Recommendations [NCRC] as presented at the hearing by David Berenbaum, Chief Program Officer, National Community Reinvestment Coalition. In conclusion, I reiterate that the time has come for members of Congress, the prudential regulators, the Appraisal Subcommittee and the Consumer Financial Protection Bureau to work collectively to ensure that consumers and all the industry stakeholders involved in the home buying and refinance process will benefit from a system of regulation that helps ensure the independence and integrity of the appraisal process while promoting equal access to responsible and sustainable credit and a robust mortgage marketplace that meets our nations immediate housing finance needs. 1. Review and define a more modern, robust appraisal reporting process and not accept the Uniform Residential Appraisal Report form by the GSEs but rather to call on the industry to define more robust and standardized reporting that can be tailored to the lending situation. The recent changes by FHFA regarding the Uniform Appraisal Dataset have only added further confusion to the already inadequate mandated appraisal form. 2. Require professional appraisals by licensed appraisal professionals for all residential mortgages above $50,000 regardless if they are originated or insured by the private sector or Fannie Mae, Freddie Mac, or Federal Housing Agency. 3. The role and impact of Appraisal Management Companies (AMC) must be critically reviewed by the ASC to ensure that they are not negatively affecting appraisal quality and further Congress should immediately investigate the emerging practice of mortgage originators assigning or requiring that Appraisal Management Companies and/or appraisal professionals they engage for business assume the buy-back risk from the secondary market or insurer claims relating to loan origination. 4. Appraisal professionals enhance safety and soundness and protect the interests of all the parties to a mortgage transaction—including consumers—and they must be appropriately compensated under any usual & customary fee standard that is developed. 5. The banking regulators, Fannie Mae, Freddie Mac and the FHA should not escape Appraisal Subcommittee valuation safety and soundness review and enforcement. 6. While Automated Valuation Models (AVM’s) serve as a useful and cost competitive compliance tool and an effective check against fraud, they should never replace the use of an appraisal by a licensed appraiser for all mortgages that exceed $50,000. 7. There is a need for more effective Consumer Protection, Transparency & Education. 8. Responsible Appraisal Practices Ensure and Expand Housing Opportunities in an Open Society. 9. Inappropriate appraisal undervaluation is equally damaging to homeowners, communities, the tax base, investors & insurers. 10. States must suspend redirecting funds intended for appraisal compliance, professional development and licensing, to their general funds. Do you need general liability insurance? You just might. Business Owner’s / General Liability Policy has been compared to a homeowner’s policy for your business. Coverage includes but is not limited to Property Damage to others, Bodily Injury, Business Interruption and Loss of Income coverage, Personal Property Coverage (computers, client records, buildings) and employee dishonesty. Inspectors, appraisers and real estate agents/brokers need this coverage. Minimum premium is $500. Workers Comp also available. Call OREP.org for details and a free quote (888) 347-5273 or email: info@orep.orgwith your request. Q: Was the agent/builder and previous appraiser correct in inspecting a home for FHA without utilities? Answer: Unless the equipment would be damaged if operated, ALL utilities must be on during an appraisal inspection. For instance, if the home had gas heat and the summer temperatures were above 90 degrees, it may damage the air conditioning unit. Solution: The appraiser would then mention the circumstances and offer to re-inspect, when appropriate, later. Q: What if the utilities (water, sewer, electric, gas) are not on? Answer: Make another appointment when the utilities are operational. Not convinced? For chapter and verse from FHA, click to read the following story: FHA Appraiser Mandates Utility Requirements – by Lore DeAstra, MBA, SRA, CDEI is Author of the FHA Checklist and eBook. Enjoy an OREP/Working RE discount on McKissock’s new 7 Hour USPAP online continuing education course, approved in most states. Taking this mandatory continuing education coursework is now affordable and convenient with this new online course. Visit WorkingRE.com and click USPAP CE at a Discount to learn more. If you are considering letting your errors and omissions (E&O) insurance policy lapse (not renewing or canceling) to cut expenses or thinking about switching to a company that does not provide “prior acts” coverage for your past appraisals just to save money, you should think again. Appraisers are being sued in record numbers today- even the careful ones. No matter the merit, appraisers have to spend time and resources defending themselves- even if they did nothing wrong. As most claims involving appraisers take several years to surface, letting your Claims Made insurance policy lapse, cancelling midterm or willingly giving up your prior acts coverage to save a few dollars could be very costly indeed should a claim arise from the past and you have no coverage. Call your insurance agent to find out what is really at stake. For more on E&O insurance issues, see Insurance: Insight and Advice from the Inside, an interview with OREP.org Senior Broker David Brauner, who has been point of sale for appraiser E&O insurance for 20 years. FHA work is booming. Here’s an opportunity to make your FHA appraising faster and more efficient. The FHA Appraiser Inspection Checklist, Checklist Instructions and eBook is designed to get you up to speed and more efficient at FHA appraising. The Checklist serves as a field guide for completing your reports. The Instructions explain how to complete the two-page checklist line by line. The eBook saves you time and money by summarizing and organizing the material you need to know. Author/appraiser Lore DeAstra says, “We reviewed more than 450 pages of HUD materials and spoke with several HUD officials to compile the FHA Appraiser Inspection Form, course materials, and eBook. It will save you time and money.” The guide is updated with the following: formatting updates for improved ease of use: more concise information in an easy-to-follow eBook searchable by topic; web links to topics for easy access; symbols and pictures included by topic for at-a-glance comprehension to FHA Checklist; FAQ from appraisers and lenders by topic with detailed index by page; over 10 new ways to access information and contact FHA to check competencies and get help fast! For more, see the inside back cover or go to WorkingRE.com and click FHA Checklist, Instructions and eBook. “Differentiating yourself from others improves your business and marketing efforts,” says author Lore DeAstra. “These revised materials will help you obtain additional avenues of income pertaining to your FHA expertise now and into the future.” OREP insureds enjoy a discount.